Tribes Overall: "All aspects were enjoyable and we would recommmend the trip to others. 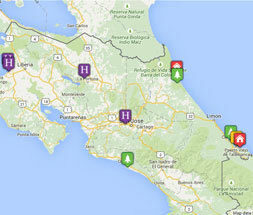 A good mix of Costa Rica's nature at its best and a relaxing Pacific ocean beachside hotel." Tribes Service: "Hotel selection was good and suited our requirements. The planning and transfers were all well planned and timed with good drivers and good quality vehicles." Guides: "Excellent, very knowledgable and informative. Friendly and helpful and unhurried. Enthusiastic about their guide work pointing out hidden treasures of nature." Ideal location on a quiet beach front. Rooms modern and boutique style, very spacious, plenty of storage with a massive walkin shower and huge comfortable bed. Excellent food and first class service from an enthusiastic staff. Cocktail happy hour not to be missed from the pool bar. Plenty of bars and restaurants nearby within easy walking distance. Very good accommodation. Excellent location for exploring the Cloud forest reserve. 2 Km from the town so a taxi or bus to get there for evening entertainment ie bars and restaurants.
" The zipline recommended was definitely not to be missed. Fabulous views over the rainforest canopy. The trips to Hanging Bridges and Cloud Forest were excellent. The Arenal and Monteverde centres gave a good mix of different natural habitats of the colourful wildlife. We saw toucan, humming birds, tantantulas, scorpions, snakes, lizards, sloths and many more colourful birds. The El Trapiche coffee tour at Monteverde gave an excellent insight into the production of cocoa/chocolate and sugar. It was very well presented and well worth the visit. I would have liked to stay longer in Costa Rica."